This significant upgrade will allow you to smoothly modulate various reverb parameters - a first for convolution plugins. As well you will have much faster access to the IR’s. • Small, medium and large studio spaces were added for more ambience flexibility. • Continuous tone motion filters were added to IR’s. This adds a deeper 3D richness, especially to sampled based instruments. The attachment is a Reverberate Bank folder that has to be placed inside THS IR Collection. More detailed information and examples are included in the following video or the updated manual. 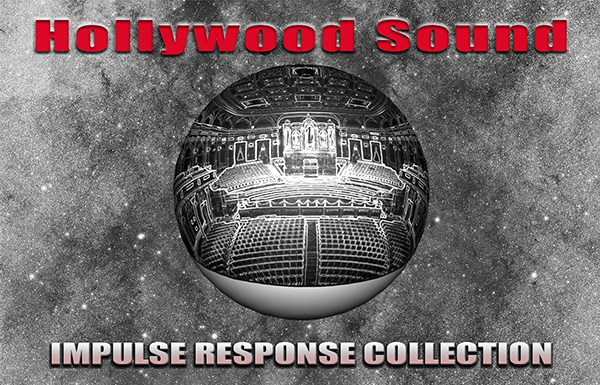 Numerical Sound, a developmental leader in innovative audio products like DNA Groove Templates, Drone Archeology, and critically acclaimed Reverb Impulse Responses (convolution reverbs), announces the release of their newest product, the high resolution Hollywood Sound Impulse Response Collection. Tailored for film composers, recording engineers and post-production houses, the Hollywood Sound Impulse Response Collection comes with 241 combination early reflection/reverb tail impulses plus 27 bonus reverb tail only impulses. These accurately match the scoring stage sizes of such recording venues as Abbey Road, Air Lyndhurst, the Barbra Streisand Scoring Stage at Sony, and others. Crimson Lake composed by Mike Verta www.mikeverta.com Three ER's were used. Violins 1, 2 and Violas were sent to "040_ER73ms_1s5_Bright_48k.wav" Cellos and Bassed sent to “175_ERa200ms_1s5_Bright_48K.wav” and master channel strip has a convolution insert with 004_ER52ms_0s85_Brighter_48k.wav” for a overall reverb 0dB wet and 0dB dry level. Similar to above but compelety dry version with no reverb. This example includes two sends the first the ER "007_ER52ms_1s0_Brighter_48k.wav" and the second a tail "255_Tail_A_1s5_Darker_48K.wav"
Only a ER is used "001_ER52ms_0s7_Brighter_48k.wav"
The version is the dry version with no reverb. Mahler This is the French Horn ensemble intro from Mahler's 3rd Symphony Movement 1. Impulse response "148_ERb150ms_1s5_Bright_48K.wav" was used which has a 150ms ER a hall size of 1.5 seconds and a bright overall character. The same Mahler passage with with impulse response "149_ERb150ms_1s5_Darker_48K.wav" which has a 150ms ER a hall size of 1.5 seconds and a dark overall character. The same Mahler passage but with no reverb - 100% dry. First two orchestral passages from Beethoven's Piano Concerto No. 4 in G major, Op. 58. The Strings were rendered with LASS (v1.5) with "The Hollywood Sound Timbral Impulse: LASS Edition" Natural Far Perspective. Three ER's were used for the ambence. Violins 1, 2 and Violas were sent to 073_ER100ms_3s0_Bright_48K.wav 2 Cellos and Bassed sent to “161_ERb150ms_5s0_Darker_48K.wav” and master channel strip has a convolution insert with “001_ER52ms_0s7_Brighter_48k.wav” for a overall reverb -8dB wet and 0dB dry level. The same as the above but with the more reverb added so you can hear the richness of the ambience. The dry version with no reverb. To order Reverberate 2 for 20% off click here enter numerical-reason in Coupon Code for 20% discount.